The youngest model in our range, but as spacious and comfortable for sailing as the older models. The exclusive design promises even more seaworthiness, dynamics, performance, maneuverability, and economic benefits. ... 3217) FUEL CAPACITY GAL (L) 75 (284) FRESH WATER CAPACITY 33 (125) WASTE WATER CAPACITY 27 (102) CABIN HEADROOM FT (M) 6'4" (1.93) SLEEPING ACCOMMODATIONS 4 PASSENGER CAPACITY YACHT CERT. 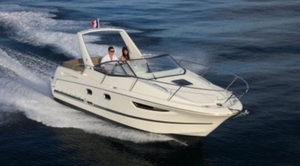 A four-berth cabin cruiser is a powerboat designed for coastal and near-shore cruising with sleeping accommodations for four people. These craft are ideal for harbor hopping, coastal cruising, recreational outings, fishing and various water sports, including water skiing. These small motor vessels usually measure between five and nine meters long, with at least one cabin and a saloon, with accommodations for four. There is generally a small galley, a head and sometimes a shower. Both inboard and outboard models are available. While traditional versions are made of wood, hulls also can be of polyester fiberglass. Most countries require a license to operate them. Boats made of synthetic materials are lighter than wood versions and require less maintenance. Some can be trailered, depending on size and local road regulations.